ALL TYPES, ALL AGES & ALL ETHNIC DESCENTS ARE NEEDED. In addition there is a special need for those of Chinese as well as Middle Eastern descents. He's probably not going to be exactly like the comics, but a modernization. Since Kingsley is known for playing other races effectively, he would be a good fit. Of course, another possibility is that it has something to do with the recent news that China is co-producing the next film. Iron Man 3 hits theaters May 3, 2013, starring Robert Downey Jr., Gwyneth Paltrow, Don Cheadle, and Ben Kingsley. The story will be loosely based on the Warren Ellis' "Extremis" comic storyline, involving the spread of a virus through nanobots. Chris Hemsworth has read the script for Thor 2 and had some interesting things to say about it to Collider. I thought the same thing about their relationship. The chemistry wasn't very strong between them in the film. So, it should be interesting to see them explore that. Cool on the Iron Man sequel. Ben Kingsley isn't Asian tho. Is he? Ben Kingsley played Ghandi - about as close to Asian as he's ever been. If they don't continue with the Thor romance aspect, I'm all right with that. Well I would say, Faran Tahir, as he great as "Raza" the terrorist, ...has a personal grudge against Tony, and was even seen wearing one of the "Ten Rings" in Iron Man I. But, Faran isn't Chinese, and the Mandarin wasn't bald. So, Kingsley? No he isn't Asian either but, didn't he play Moses or Abraham or something? I don't know. I like Ben as an actor, and he might make a good Mandarin. But, besides not being Asian, I think he's a little short. No offense intended, of course. Just that, the Mandarin should be tall and imposing. And should strike fear into the souls of men. I'm not sure Kingsley can do that. I mean, "maybe"? But I would be looking for someone more like Vincent Price. Yeah I know he's dead. But there was just something about Vincent that made you, fear. Even when he wasn't wearing a costume. Know what I mean? Alex, my wife would be upset if they dropped the romance. I'd just keep watching the flying hammers. Actually Ben Kingsley is very much Asian- Indian to be precise. Good point Neil. I forgot he was East Indian. 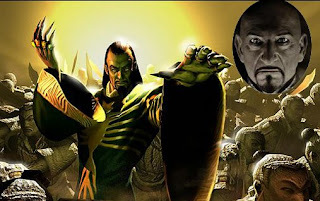 Bargain Hunter, it will be a stretch for him to play the Mandarin physically, but I think he has the menace. Kingsley could always wear a wig I suppose. It really was the weakest part of the film.